I fancied being creative in the crafty sense and decided I wanted to paint my own matryoshka doll which is a Russian nesting doll. I decided to search the web for a wooden blank doll and came across these cute little blank peg people. As a child I remember going to Scotland and being able to buy cute little clothes peg dolls with woollen hair with Scottish kilts and I remember getting a DIY dolly and making her myself. The only problem I found was I wasn't able to give her much of a face as the round end was quite small. These peg people had much larger heads and I really wanted to have a go. There were so many wooden blank products I decided to buy some discs, small egg shapes and of course a selection of peg people. I was so excited to receive my creative package and decided to create a little family portrait of myself, my boyfriend, Mike and my chihuahua, Paul. 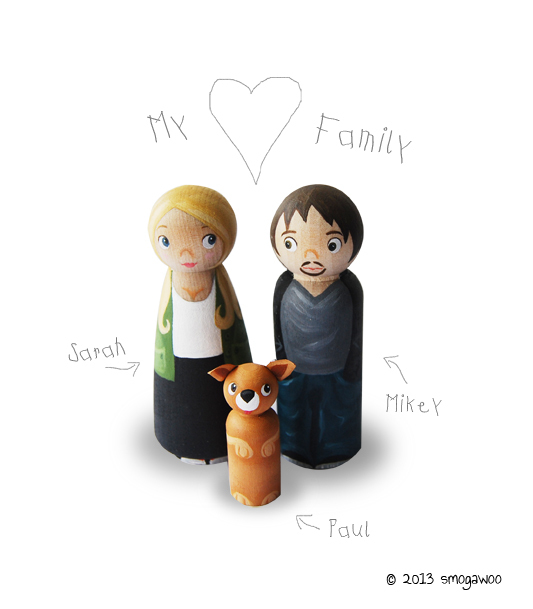 Family and friends loved them and I have had a few asking for a portrait of them :-) I decided it would be a great little product to go alongside my traditional family portraits so "Peggies" were created. What I love about them is that I can still create little characters that are not miles away from my painting style. I decided to predominantly paint the pegs to give that portrait feeling. 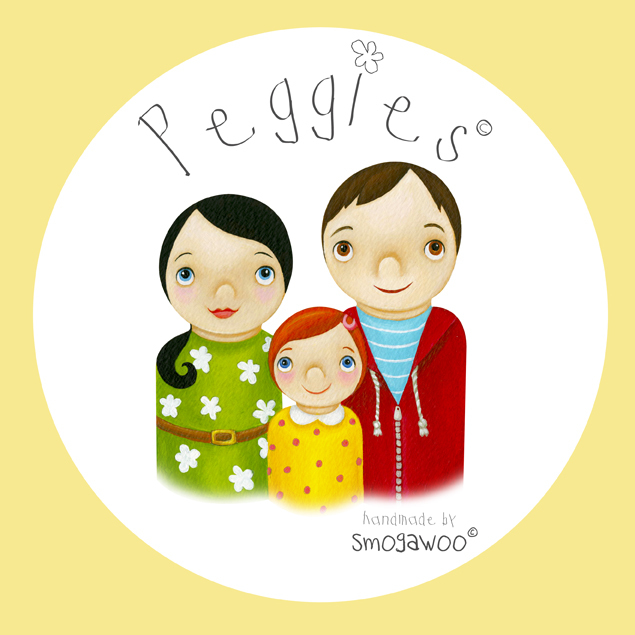 I am currently working on a variety of "Peggies" to put in my new Smogawoo Etsy store. I can't wait to get it up and running. I have so many ideas for them including Christmas decorations. I am having so much fun designing and creating them. Just to top it off I have had my first commission and I'm in the process of creating a family of seven, with lots of cats!